The Savvy Baby™ will not expose your baby to toxic flame retardants, phthalates, or pesticides. Its Firm Dunlop natural latex core is encased in the quilted Savvy Rest casing, made of organic cotton with organic wool batting. Click any photo below for baby product details and pricing. Pure, safe, and supportive for growing infants, The Savvy Baby mattress is made of a single, solid 5” layer of Firm natural Dunlop latex. Densely woven to resist moisture breakthrough, the natural wool crib mattress pad protects your baby's mattress. The beautiful Oeuf Crib is simple but versatile, and made to strict environmental standards. Slim side rails create a light, airy feel. The solid 5" layer of Firm Dunlop latex gives your baby the support he or she needs. 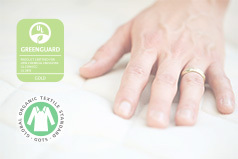 A soft mattress isn’t safe or comfortable for babies, which is why we only use our firmest latex. Safety is our number one priority, both in terms of construction and the actual materials used. High exposure to chemical flame retardants during pregnancy can lead to lower IQs in children.